Search and adopt a Norwich Terrier near you. Gay, fearless, loyal and affectionate. Adaptable and sporting, they make ideal companions. 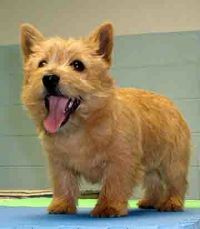 The Norwich Terrier, spirited and stocky with sensitive prick ears and a slightly foxy expression, is one of the smallest working terriers.